In most cities, retrofit opportunities outnumber street reconstruction opportunities. 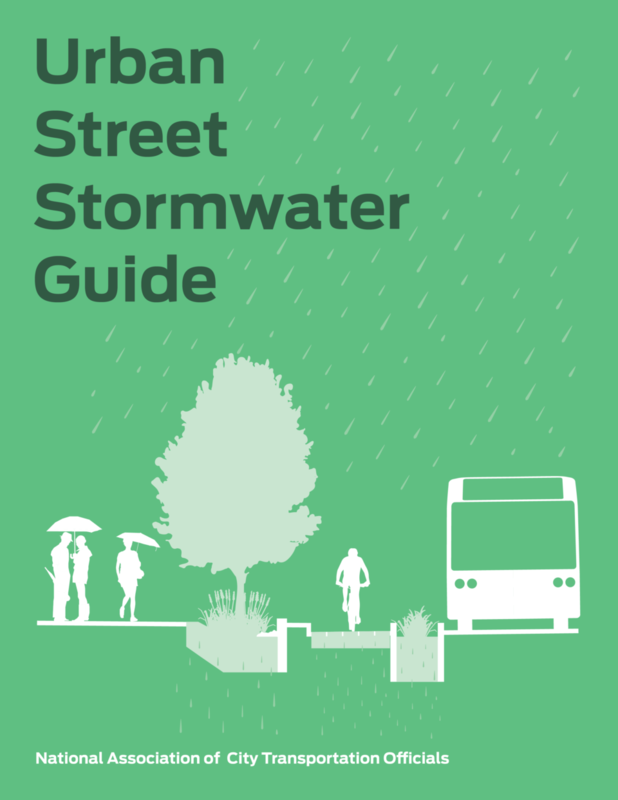 When retrofitting a street to incorporate green stormwater infrastructure, evaluate the street with a critical eye, and look for opportunities to make geometric and operational changes. Assess existing features, structures, and infrastructure within the right-of-way. Review setbacks and clearances from driveways, loading zones, bus stops, utilities, buildings, mature trees, and other features. Assess traffic volumes and parking utilization to identify streets that have excess capacity for automobiles or whose motor vehicle traffic can be served in shared surfaces. Reallocate space from overly wide streets and lanes or under-utilized on-street parking to active transportation and green infrastructure. In areas with high pedestrian activity, sidewalks typically include width for street furniture between the pedestrian zone and curb line. In residential neighborhoods with less pedestrian activity, the furnishing zone may be landscaped between the sidewalk and curb edge. 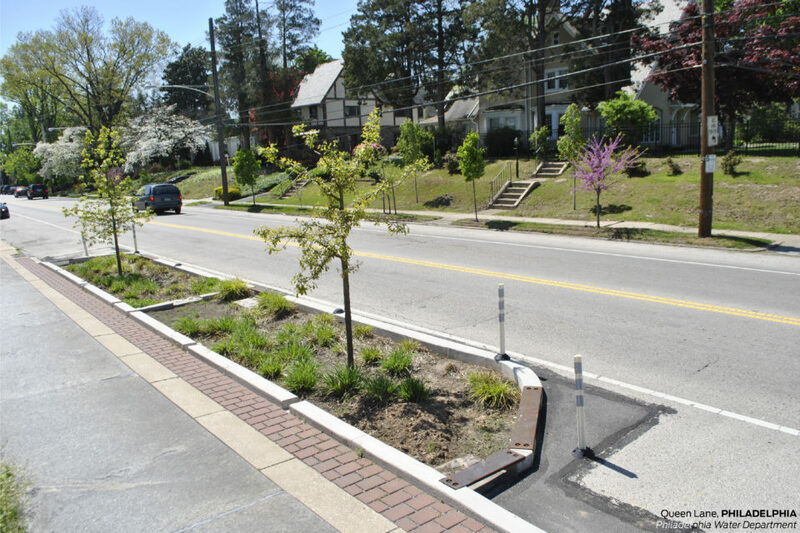 Locating bioretention facilities and pervious surface where width allows can accomplish infiltration while providing opportunities for tree canopy and further buffering pedestrians from motor vehicle traffic. The condition of existing infrastructure such as pavement, above and underground utilities, transit facilities, and trees may dictate the scope of a retrofit opportunity and inform construction cost estimates. For example, to avoid replacing existing utilities, further setback to protect the utilities may be required. Street trees contribute significantly to a city’s greening and stormwater management, but may pose a constraint in retrofit or reconstruction projects. Mature trees are often protected as part of a city’s efforts to improve urban canopy coverage, air quality, and public health while reducing the urban heat island effect. The recommended proximity of bioretention facilities to existing mature trees depends on the species and root structure. With planning and consideration, both systems can be accommodated and can jointly contribute to a successful green street. Assess the existing street design for opportunities to improve safety, pedestrian access, or transit operations. There may be bioretention strategies that can address other concerns as part of a single retrofit project. 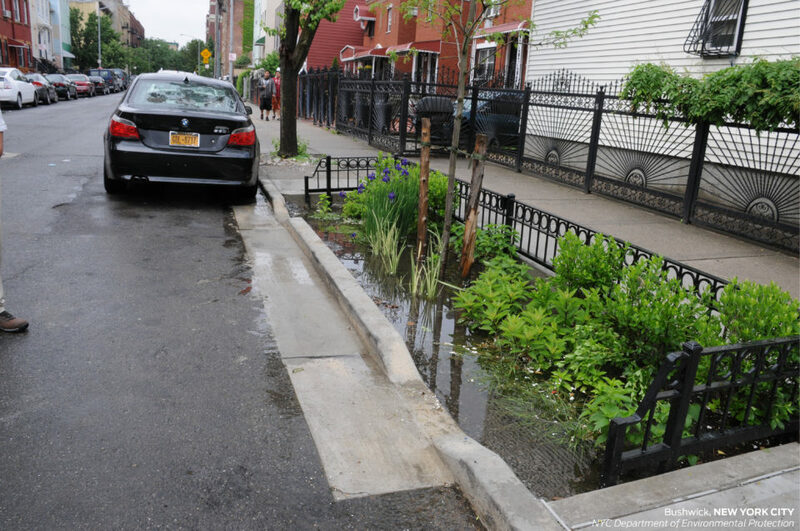 Aligning a stormwater retrofit with a mobility project is not only spatially efficient; coordination can also unlock additional funding and resources. Test new street configurations with interim materials to evaluate the mobility impacts and human behavioral changes. Use pilot projects to experiment with retrofit designs before investing in a full street reconstruction. Green infrastructure can contribute to placemaking initiatives, enhancing public space with greenery and other amenities. 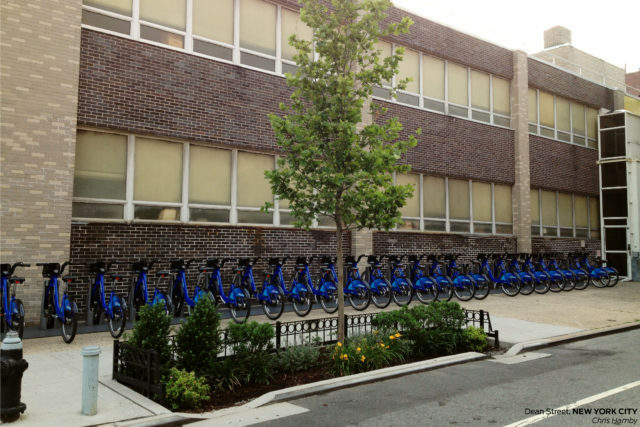 Align GSI projects and funding with placemaking initiatives to incorporate bike parking, bike share stations, street cafes, festival streets, and spaces for community gathering.